Dear friends — choose holiness this very day. God is looking for a holy people, set apart — distinguishable from carnal, sin-loving man. It’s time for the real church to get back in line with The LORD’s agenda for the Body of Christ. Let’s bring back the principles of holiness and righteousness into His house! 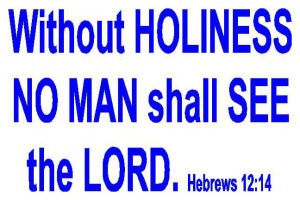 God is pleased with holiness…so we need to be holy…whether others are watching or not…in all circumstances…whether at a church gathering, at work or at home with families. a certain point to a certain destination! To reach the desired destination, we have to take the correct route that leads to that very destination. Salvation, which we have gotten by accepting Jesus Christ into our lives as Savior is the sure start of a Christian journey whose destiny is to be with LORD forever and inherit the Kingdom of Heaven. The highway that a Christian ought to walk on is what we are going to be looking at today.